Alderney’s gannet populations are the most southerly in the British Isles. 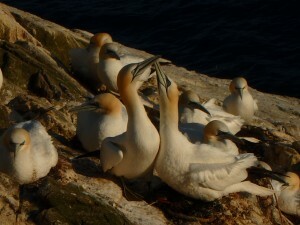 Northern gannets are identified as an ‘Amber listed’ in the Birds of Conservation Concern 3 (Joint Nature Conservation Committee), and perhaps one of the most charismatic of British breeding seabirds. 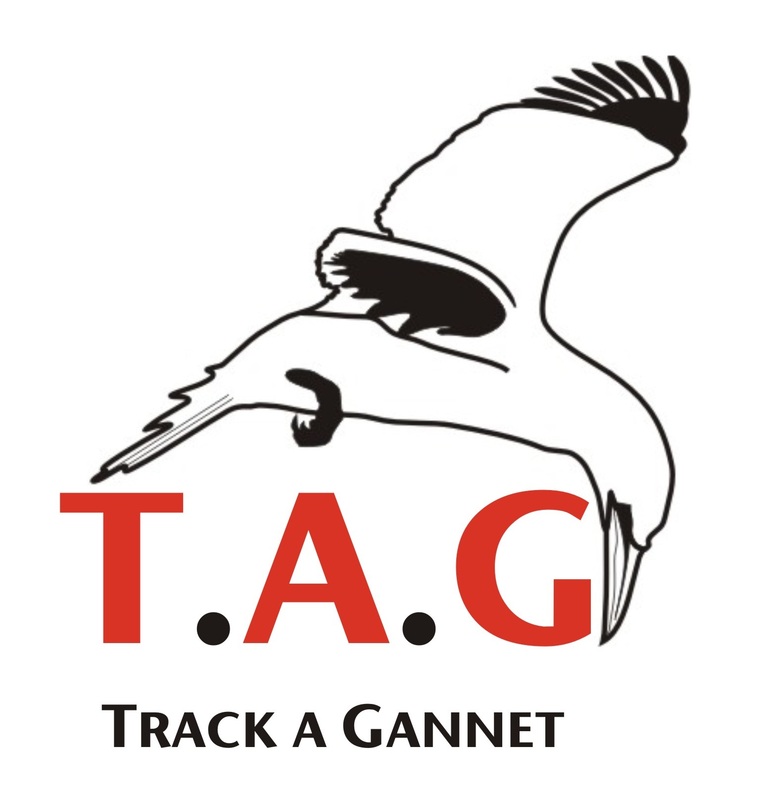 The tracking is done by fitting prototype GPS tags which have been developed by the BTO and the Universities of East Anglia and Lisbon and transmit data in near real time. 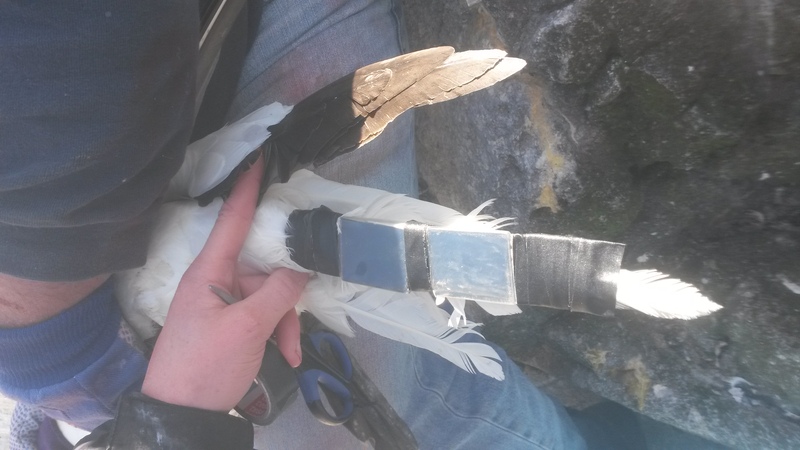 The devices were attached to the tail feathers of 20 northern gannets by a team from the AWT, BTO and University of Liverpool, and connect the birds with any 3G enabled mobile network they come into contact with, at which time the tags download the track of where the birds have been. 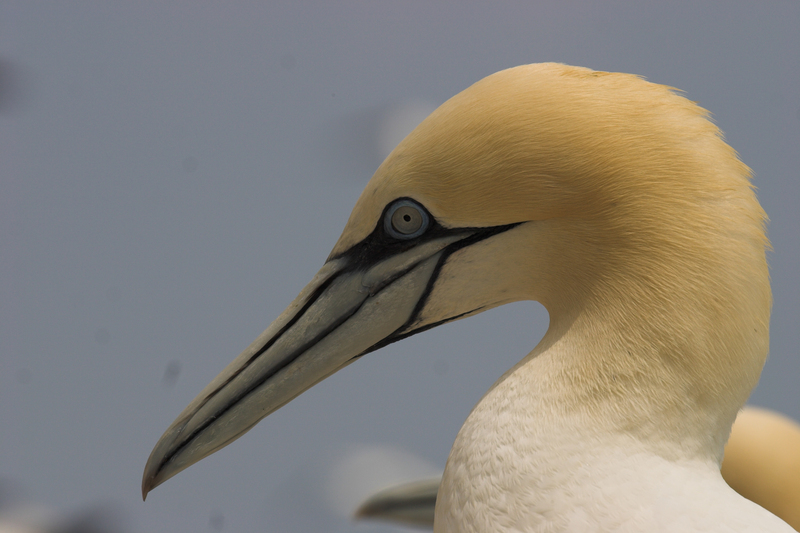 The tags transmit the flight paths of the gannets to the website which updates every time a bird comes within range of the European 3G network. 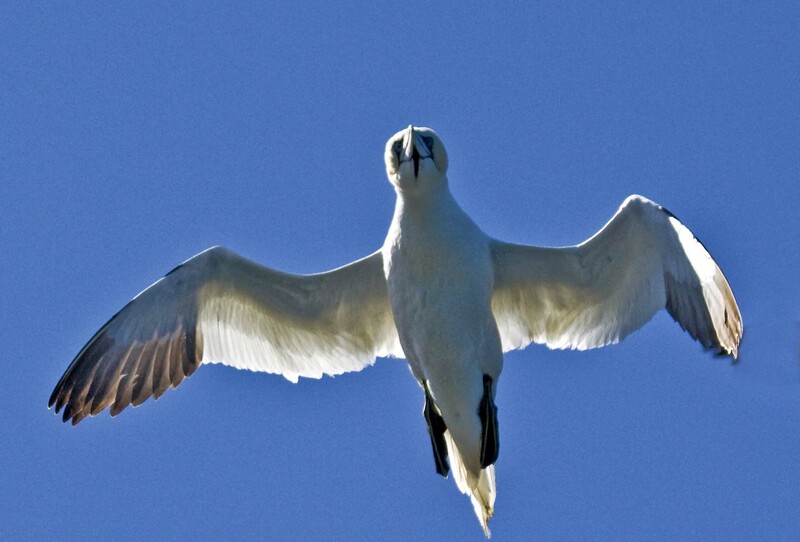 The website offers the most ‘real time’ form of monitoring ever attempted on birds at sea. The same webpage also has a live streaming GannetCam webcam which is situated on the Ortac gannet colony. 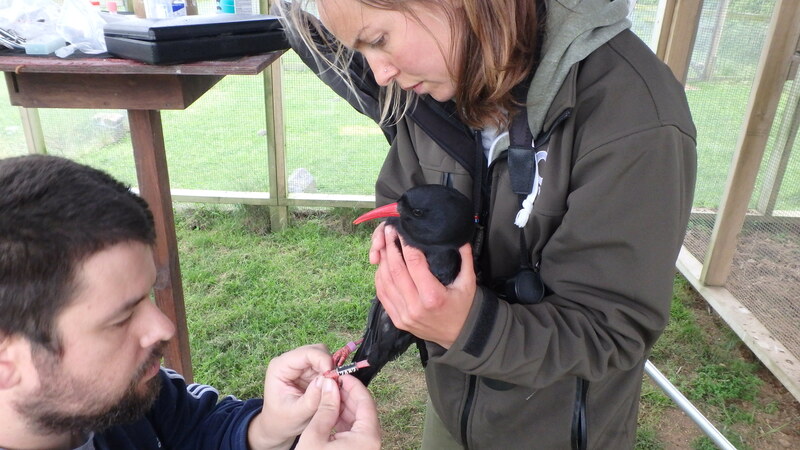 The webcam enables both scientists and the public to get a much more detailed glimpse into the birds’ behaviour within their colony. 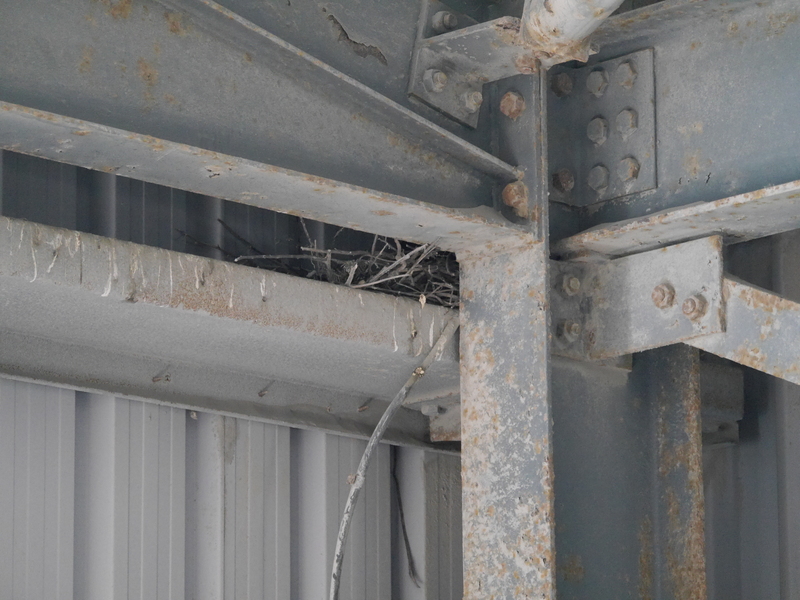 In fact, several of the birds with tags on are nesting in front of the camera and can, therefore, be followed live both through the transmitters and the camera. If tags survive until the chicks have left our waters it is hoped that the project will yield the first live streaming data from gannets heading to their wintering grounds. 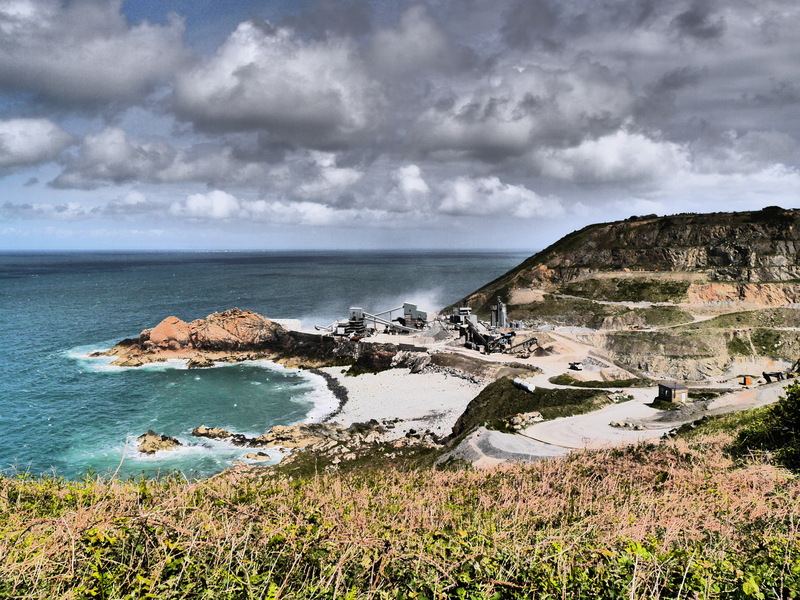 Alderney hosts a number of important seabird colonies in the English Channel and with six wind and three tidal developments proposed in waters surrounding the island under consideration by UK, French and Alderney governments, the Alderney Wildlife Trust is increasingly concerned about the need to understand and protect its seabirds. Our vision for ‘Living Seas’ includes ensuring development in our seas is ecologically sustainable and it is only with increased knowledge of the marine environment that this can be fully achieved. The T.A.G. page is now live so you can start seeing the birds and their tracks. It is likely that the website will be modified soon so we only see the last three days of tracks (data from when the tags went on will be stored). 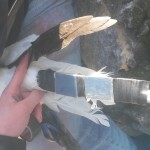 Another eight tags to replace the ones that failed will go on to birds shortly to increase the data set. Nesting advances to the next stage! 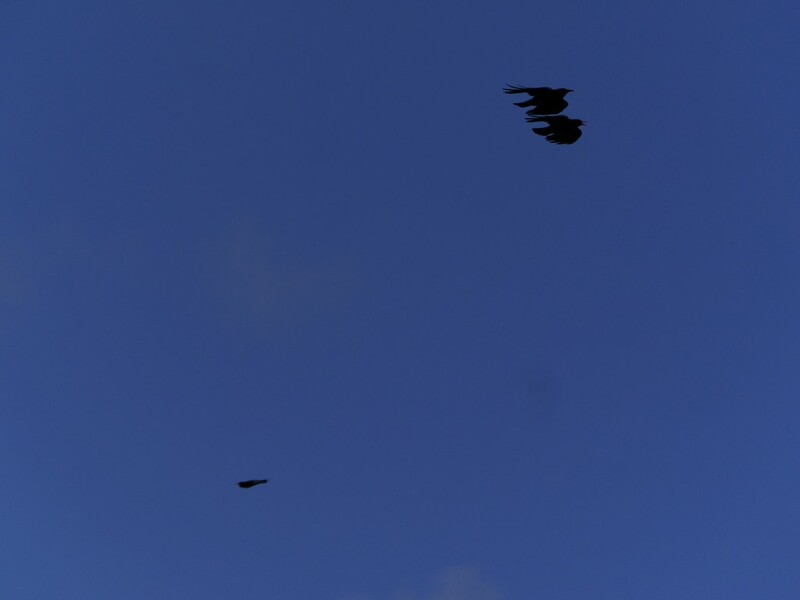 The merry month of May held true to its poetic title this year and bore witness to the return of breeding choughs in the wilds of Jersey. After the flourish of nest building activity and copulating in April we noticed a change in the adults’ behaviour. Mauve and Blue were often absent or late to the feeds at the aviary. 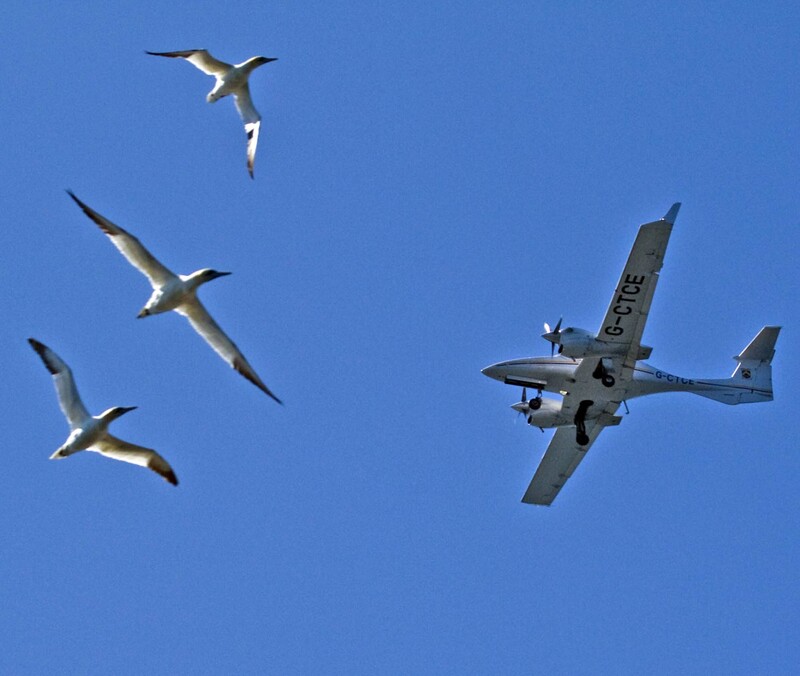 Their respective partners White and Green would be there, hurriedly eat, and then fly off towards the nesting sites. For those of us monitoring the nest sites it was quite tricky to see what was happening. Why? Because they decided to nest in Ronez Quarry! 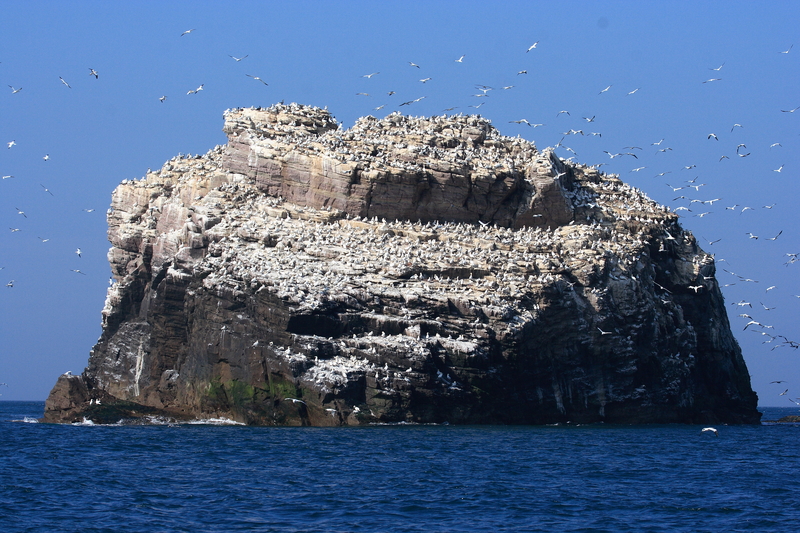 We could only watch the birds as they flew back and forth between Sorel and the quarry and calculate how much time was being spent at the nest site. This is actually quite useful because as, breeding behaviour changes, so does time allocation at the nest. 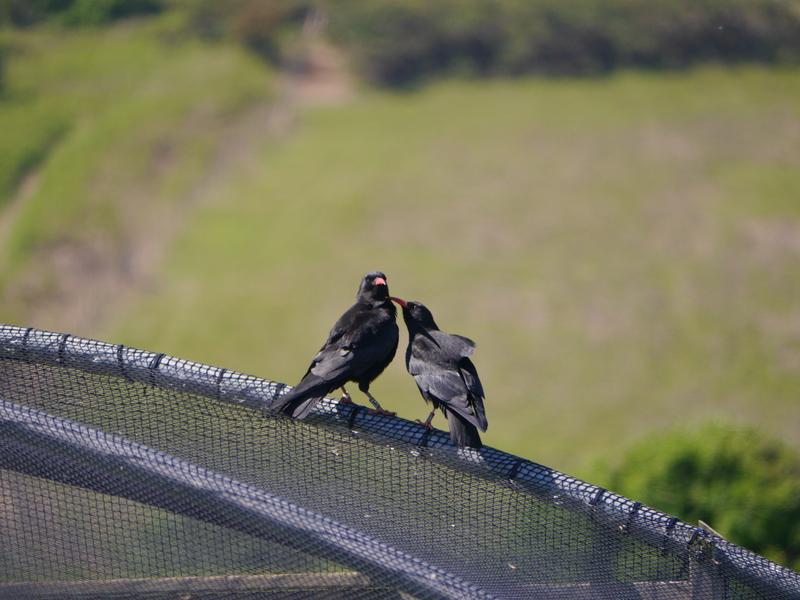 We know patterns of time allocation from breeding behaviour in UK choughs, especially Cornwall where nest monitoring is carried out every year as a form of protection as well as research. 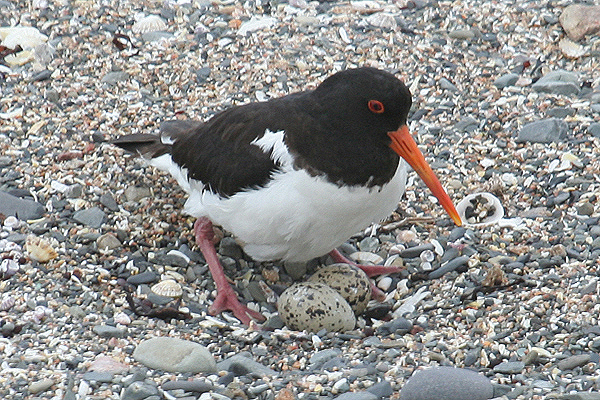 The female incubates the eggs and is fed by the male on the nest with the odd flight during the day to stretch her wings and get more food. 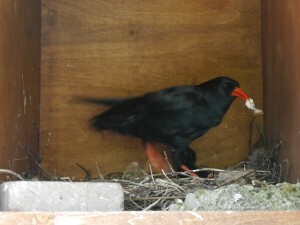 Once those eggs hatch there isn’t much difference in behaviour as she spends the first week or two brooding the chicks. After which point the chicks are bigger and require much more food so both parents go out and forage. At the start of May we observed the males frequently making solo flights between the nest sites and headland. 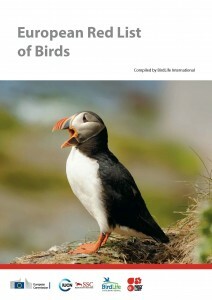 Combined with the females’ absence along the clifftops it suggested they were incubating! 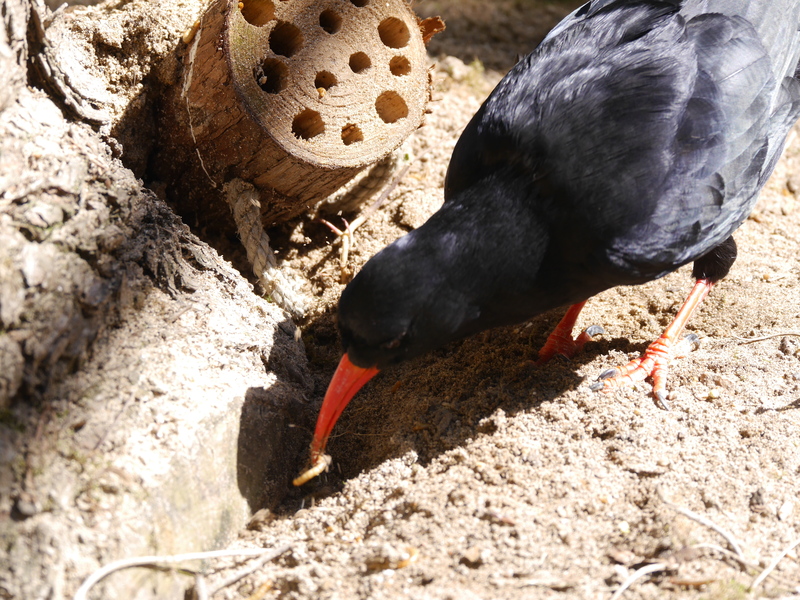 The really interesting behaviour was watching the male feed at the aviary when we added the supplementary diet. He would then fly back to the nest site, seconds later the female would emerge and then fly together to the aviary. It was as if she was waiting for him to confirm that dinner was ready so she didn’t have to waste energy flying back in case we weren’t there. I have to say this behaviour was most prominent between Green and Blue. White and Mauve did something similar, but alas White’s young mind would often wander and he would easily be distracted on the flight back if he bumped into another chough, especially Black, the female he was still courting. Mauve had to put a lot of effort in and was often seen at the aviary begging frantically for food from either White or the team. We decided to increase the amount of food we were supplying since everything was being eaten and the females were obviously needing to maintain their energy stores. The juveniles on the other hand just thought Christmas had come early and revelled in the extra food. We do exactly the same for captive birds at the Park if they are polishing off their food. Our consideration for Sorel, however, is whether this means there is enough food and/or sufficient foraging habitat for choughs during the breeding season. 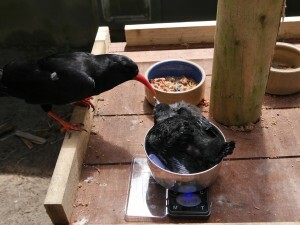 We don’t want the choughs to become reliant on the food we give them. At the same time the fact that we have choughs incubating in the wild for the first time in a century means we would not want to risk starving the birds. 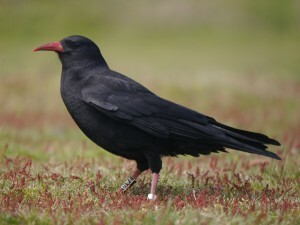 The pattern of behaviour with the breeding pairs continued for three weeks; choughs incubate for 19-21 days. Then change was in the air. On 22nd May, I received a call from the Quarry, one of their staff reported hearing a ‘cheeping’ noise from Mauve’s nest! We had already paid a visit to the quarry to see exactly where the nest sites were, so we knew that it would not be possible to visually confirm chicks without disturbing the nest. Instead we had to rely on behavioural patterns again. 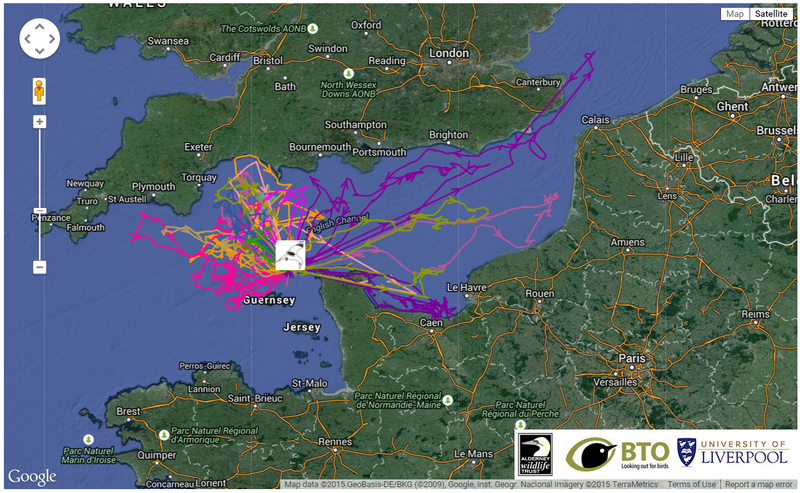 Over the next 48 hours we started seeing Mauve spending more and more time away from the nest site. 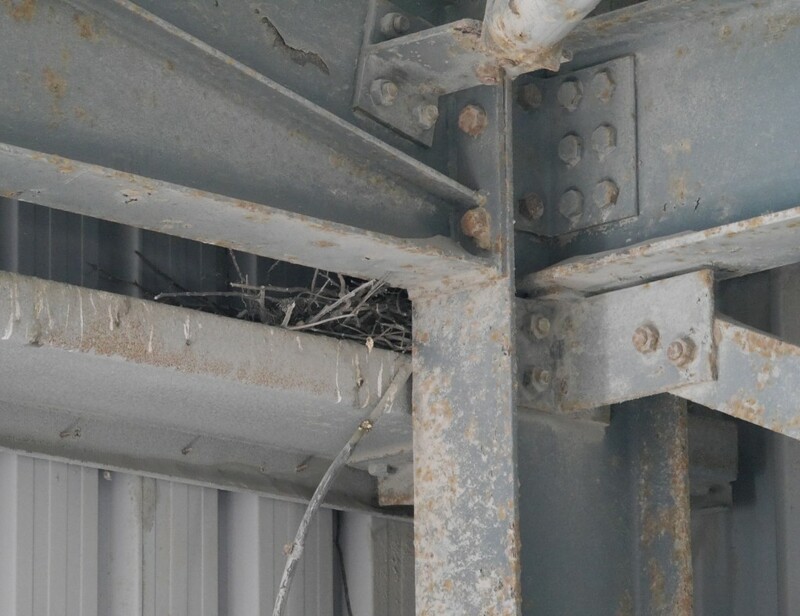 Due to the Bank Holiday weekend we were not able to access the nest until the Tuesday by which time we were confident that Mauve had abandoned. With assistance from Ronez staff I climbed up and checked in the nest hoping to find something to indicate what had happened. It was spotless. 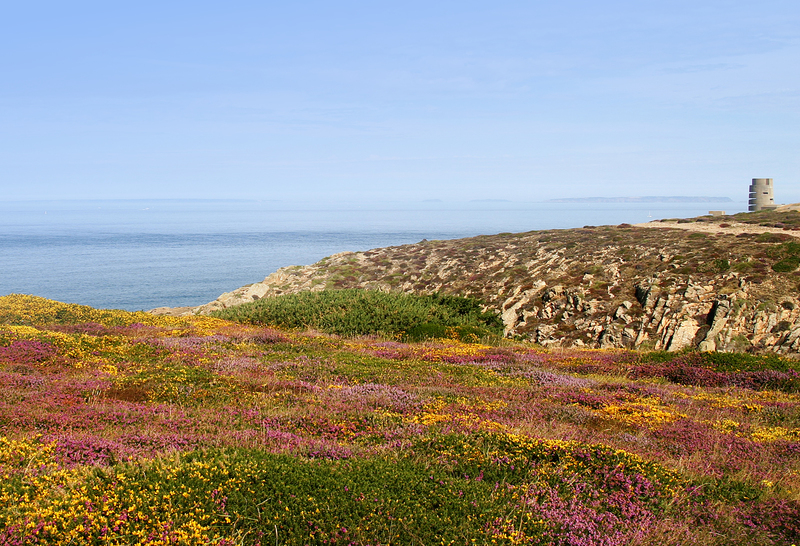 Impressive engineering from Mauve and White led to one of the first wild chough nests in Jersey in a century. Photo by Liz Corry. 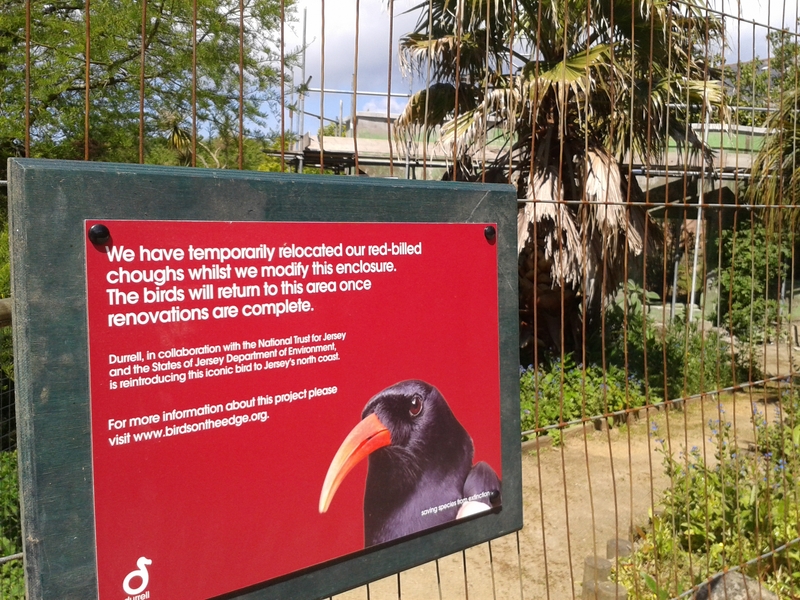 Our choughs have used fibre glass insulation found in the quarry as well as sheep’s wool to line their nests. Photo by Liz Corry. A perfect nest with twigs, sheep’s wool, and fibre glass insulation (apologies Ronez for any damage to property). On a more positive note Green and Blue continued as normal and we wait anxiously. I can only hope that the fact their pair bonding is stronger and they are that little bit older means they will have more success. We mentioned last month that Dingle had paired up with Red and started nest building. They are still a pair but never really got anywhere with a nest. Having spoken to quarry staff it appears we had four females trying to nest in various places around the quarry. Moving twigs from site to site with only two finally feeling happy with their choice. This is an amazing achievement for their first year breeding and first year living free in Jersey. It bodes well for the 2016 breeding season. Back at the Park we had a much clearer idea of what was happening. 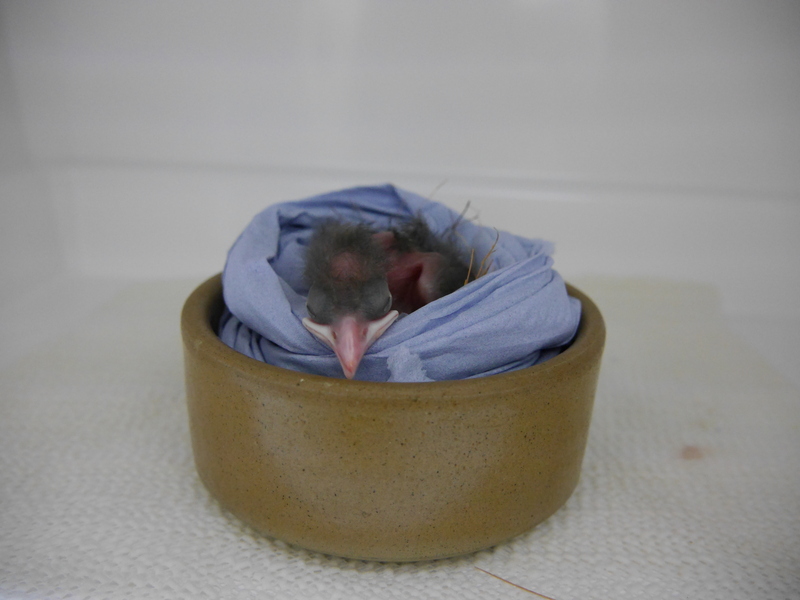 On 1st May a very punctual chick emerged from the egg that was being artificially incubated. We hand-reared it for the first five days feeding it from 6am until 11pm using the same methods as last year. 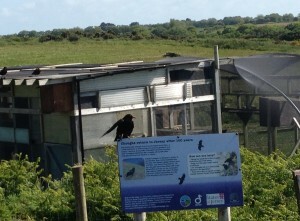 This time round we were faced with the problem of rearing a chough in isolation. Last year having four chicks together meant they would be socialised and learn from each other exactly what a chough looks and sounds like. 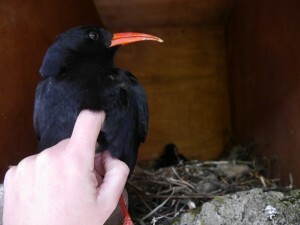 With a single chough the chances of imprinting are much higher. We decided to try foster-rearing using Gianna as mum. This was not without its own risks. What is she didn’t take to the chick? Would she know what to do? Would she be able to feed it enough since she had no partner to feed her in the nest? The answer to the latter was easy. We became her partner. We would go in and feed her and if needs be feed the chick as well, but, ideally, she would do it to feel sufficiently bonded with the chick. The first question was the tough one and there was only one way to find out. When the chick was five days old we moved it in with Gianna. I went in to feed and preen (tickle) her then swiftly switched her egg for a chick. What happened next melted the heart, she went to the nest box as I pretended to leave. I didn’t want to disturb her so walked to the other side of the aviary and watched carefully. She went to sit back on the ‘egg’ then hesitated, looked down puzzled, looked outside (I won’t say ‘at me’ as that is far too romanticised), then very carefully sat down and brooded the chick. The clip below was taken at a later date when Gianna was more confident. I sat by the safety porch out of sight but still inside in case things turned nasty. It was silent for exactly 28 minutes, then movement. Heart in mouth I watched, half expecting to see a bill appear with a chick dangling down. Instead it was a faecal sac belonging to the chick. Gianna flew out and across to the opposite corner of the aviary, deposited the faeces, cleaned her bill, then flew back to the nest. Now maybe this is something only a bird keeper can appreciate, but this was one of the most satisfying sights to see. The next hurdle was seeing if she would feed it. It wasn’t a smooth start. Gianna knew it needed to be fed, she knew exactly what call to make to encourage the chick to beg, but she couldn’t quite work out how she got the food from her bill into the chick’s. It took three feeding attempts throughout the morning as she teased the chick with food overhead. To be fair, a single chough chick in a nest wobbles around a lot when its begging making it a very fast moving target. By the fourth feed something switched on and she figured out what to do. We continued to support the chick by hand-feeding pinky mice and papaya, but since Gianna did such as great job we left her to it after a few days. We still went in six times a day from 7.30am until 7pm making sure she had enough supplies and, being Gianna, enough attention. It takes 41 days for a chough to fledge so pretty much the rest of May was spent just making sure the chick grew strong and healthy. Once this chick has fledged and is independent from Gianna it will be moved up to Sorel to take part in the 2015 release this summer. Gianna’s foster chick was the only egg to hatch from Issy’s clutch of five. They re-made their nest but never got around to laying a second clutch for reasons unknown. The second egg being artificially incubated was the one rescued from Gwinny, or more accurately from the Dad who had an aversion to eggs. This pair also failed to lay a second clutch so it was really important that their egg survived. The incubation period or this egg was an anxious one. It’s weight-loss graph suggested it wasn’t going to survive. 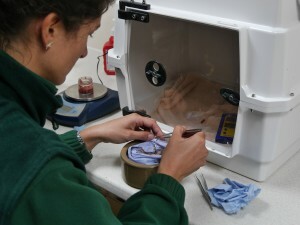 Bird Staff worked hard to reduce humidity keeping the incubator and room as dry as possible. In the end a very delicate and nerve-wrecking procedure of drilling a small hole into the shell was carried out. This had the desired effect after which point it was a case of sit and wait. Not long past the due date the chick inside started to chip away at the shell and eventually emerged. It has responded very well to life outside of the shell and is piling on the pounds in a good way. It now consumes about 20% of its body weight per feed, which equates to a lot of insects. As with the foster chick we hope this one will make it up to the release aviary this summer. 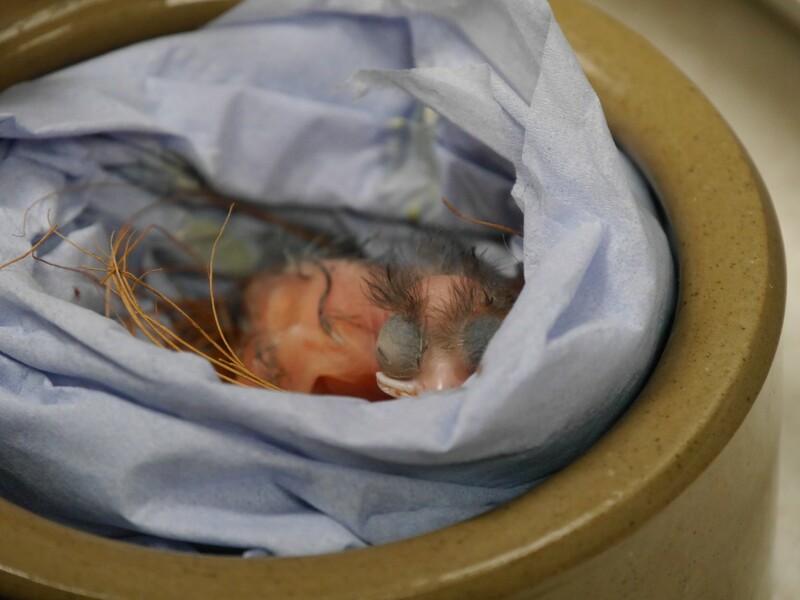 The video below was taken when Gwinny’s chick was only a few days old and had not opened its eyes yet. When the eye slits start to open we feed wearing a black glove and using orange tweezers. The iPod is used to playback the sound a female chough would make at the nest to announce she has food. It isn’t always necessary if the chick is already begging. 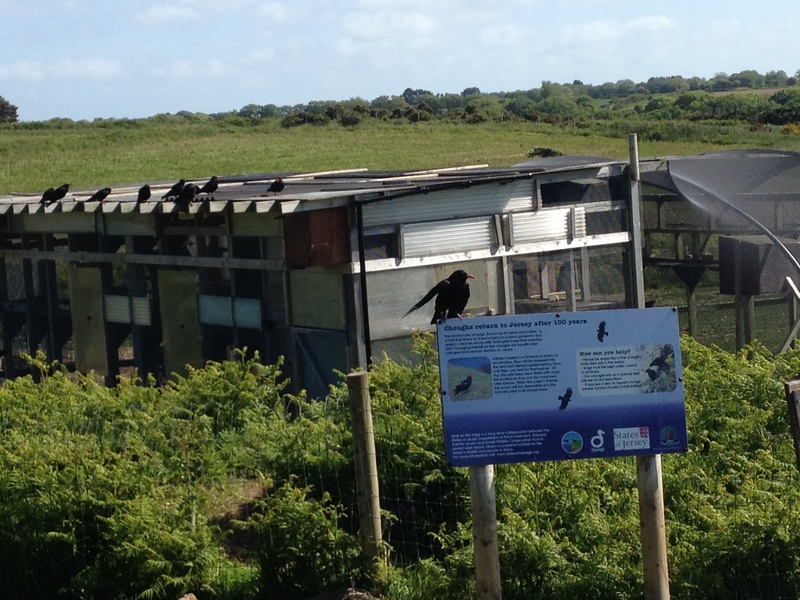 Guided chough tours now offered…by choughs. Photo by Harriet Clark. We started noticing moulted feathers in the aviary at the start of May. A few days later the choughs at the Park followed suit. For the Sorel choughs this meant that the remaining radio-transmitters started to drop off. Their batteries are still active so we should be able to find them (unless they fall in the sea). If you are visiting Sorel and happen to find one please pick it up and contact one of the team we can refurbish them for the 2015 release. Shortly after Mauve abandoned her nest we noticed that she started looking a little run down and began sneezing and spluttering quite badly. She was caught up in the aviary and looked at by the Vet. Faecal samples showed she had nematodes and she was under weight. Highly likely to be stress-related, we kept her locked-in for a week and a treatment of Ivermectin. When she was looking better we released her back into the group. 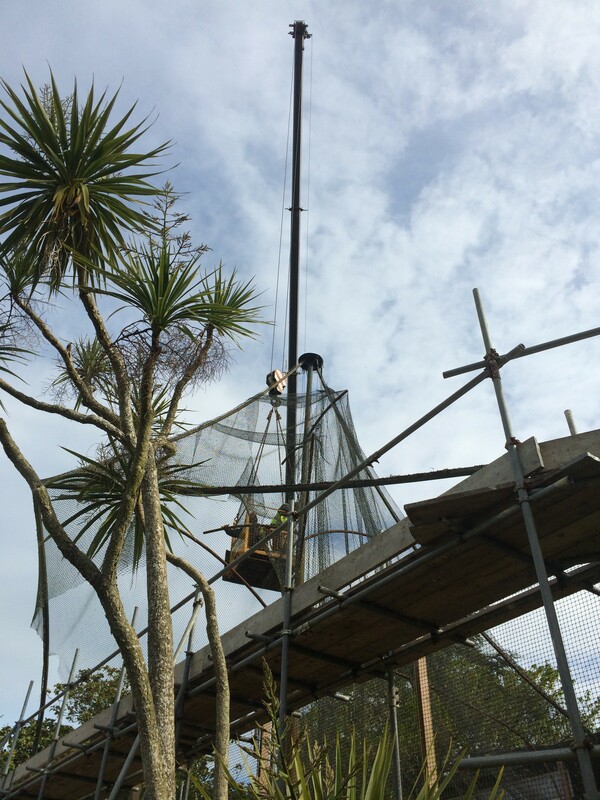 Thanks to a very kind private donor work can now begin on the renovation work for the display aviary at Durrell. As you can see from the photos it isn’t an easy job and will take several weeks. 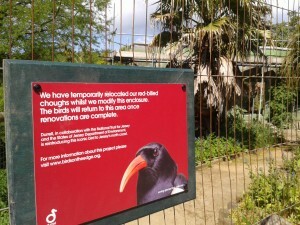 Once ready we will once again be able to flock the choughs together over the non-breeding season. 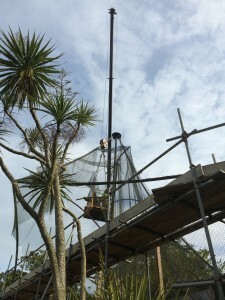 Work began this month nf repairing and redesigning the display aviary at Durrell. Photo by Glynn Bower. The Institute of Zoology held a symposium in May entitled ‘Health and disease in translocated wild animals’. Organised by Tony Sainsbury and John Ewen (ZSL), Katherine Walsh and Ian Carter (Natural England), and Matt Hartley (RSPB) the two-day symposium reviewed the impact of disease on species restoration through translocation, and considered lessons learned to guide effective planning and implementation of future translocation projects. Health management of conservation interventions was discussed, including methods of disease-risk analysis, evaluation of disease management alternatives, use of molecular tools to unravel disease risks, mitigation of diseases and methods for post-release health monitoring. 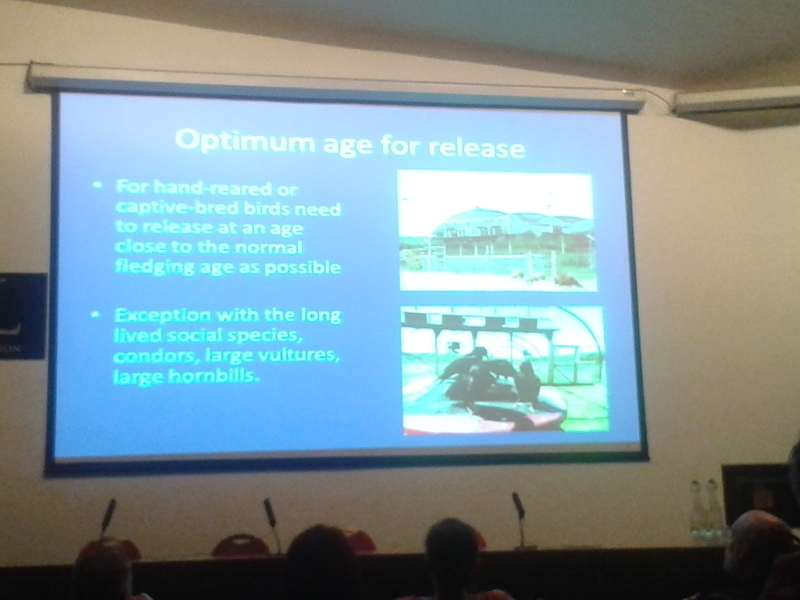 To kick off the second day Prof. Carl Jones, chief scientist at Durrell, talked about managing behaviour; appropriate socialisation and early learning to enhance survival using our choughs as a case study. 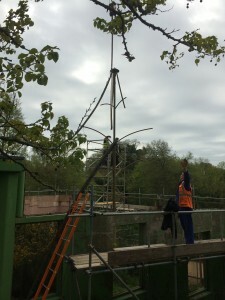 Bean, Dingle and company fulfilled their flagship role that day and brought the Birds On The Edge project to the attention of a international crowd. In a good way I might add! Proceedings of the talks will eventually be published in EcoHealth and made available upon request. 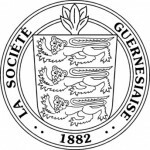 La Société Guernesiaise is to use its herd of six Guernsey steers to try to attract the skylark back to the Island by reintroducing grazing to the Port Soif Common area this summer. 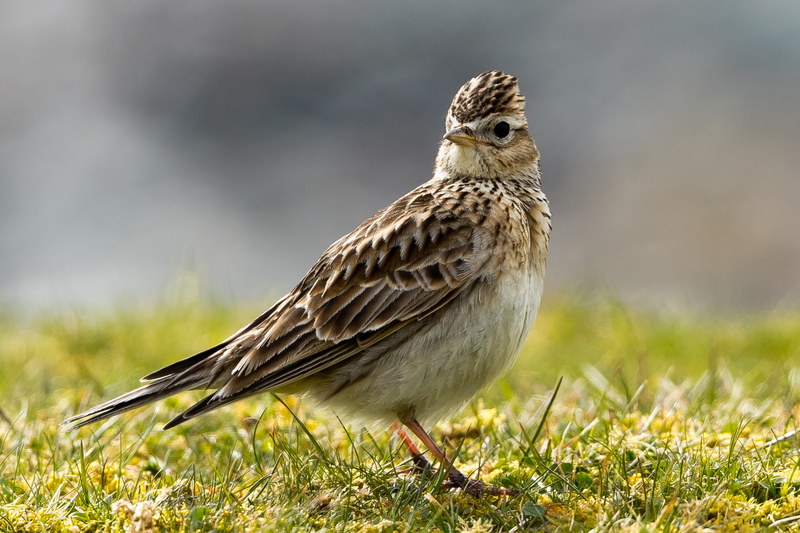 Many Islanders will remember the wonderful sight and sound of the skylarks that were once widespread in Guernsey, but sadly, apart from the odd visitor, no more. 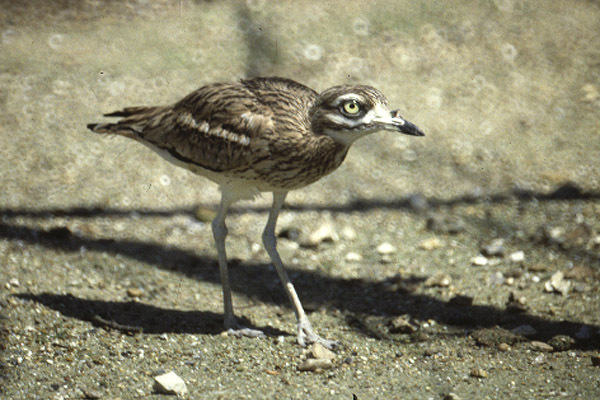 The area around Port Soif was well-known for these lovely ground-nesting birds, but none has bred there for about eight years. 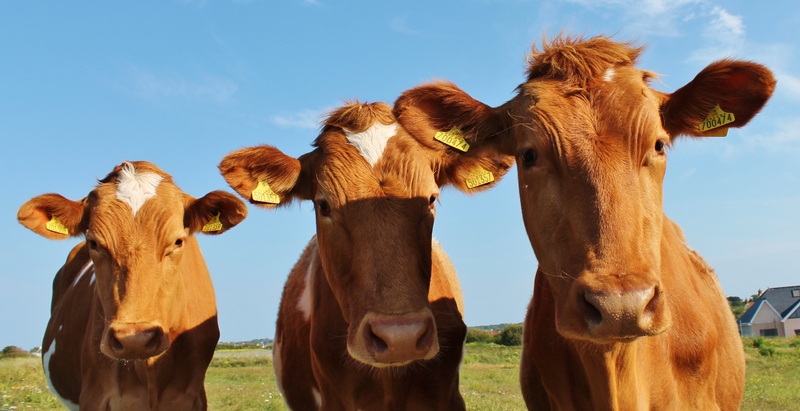 The Conservation Herd moved to the area last weekend and will be grazing there for roughly six weeks to try to re-establish the habitat that attracted the birds to breed there. 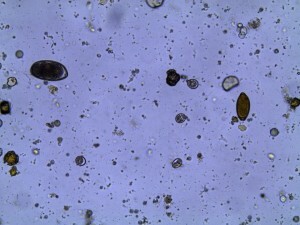 Physical disturbance of the ground by trampling creates small bare patches of earth which disturb the seed bank and helps the germination of wildflowers. 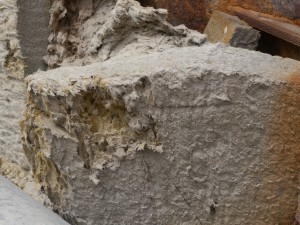 This has the potential to allow plants which may once have been considered lost from a site to re-establish or spread. These bare patches can also be important for ants and nesting solitary bees and wasps – and, hopefully, skylarks. The birds won’t have far to travel. 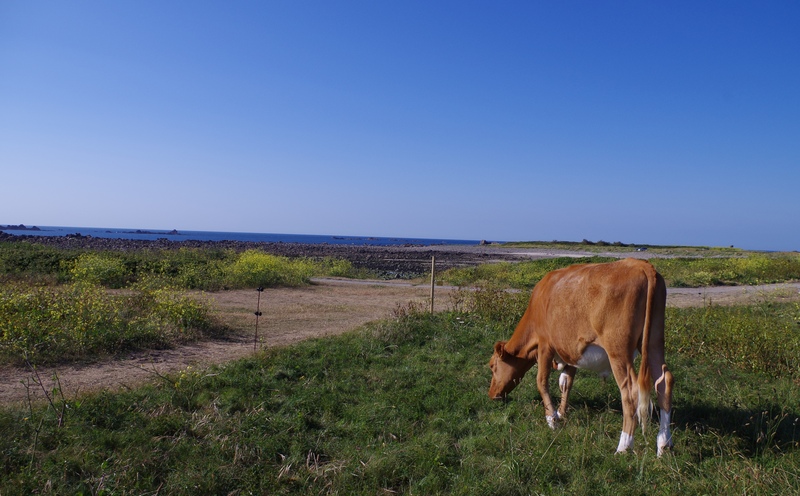 Jersey still has a population and conservationists there are very supportive of our efforts to bring some back here. 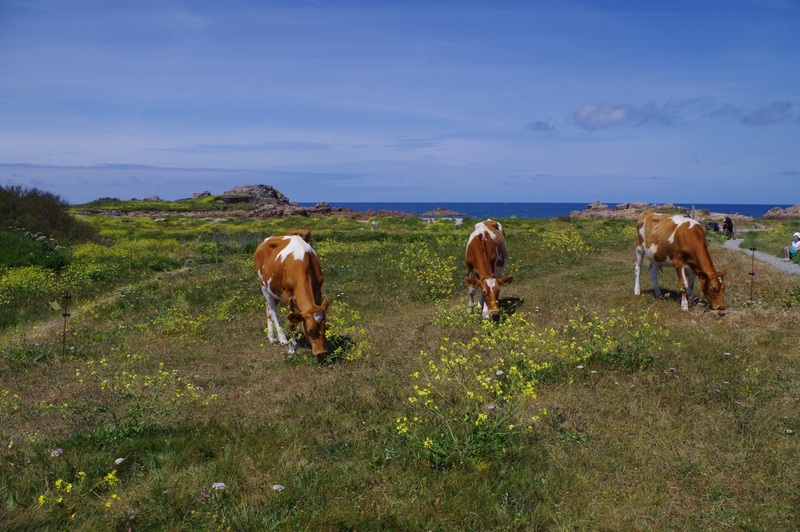 The land is managed by Guernsey’s Environment Department and since traditional grazing ended, the area has been tractor-mown each year. Tractor mowing is efficient but leaves the cut vegetation on the ground and a ‘thatch’ of dead grass builds up, the thatch smothers finer grasses and plants, encouraging coarser plants such as common hogweed and brambles to thrive. Reintroducing traditional grazing will increase the range of plants found here and an improved habitat will develop for insects and small mammals. Grazing these areas of land will also allow the grassland to retain small tussocks of grass which are ideal nesting sites for skylarks. 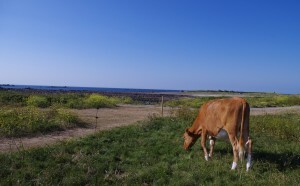 The Conservation Herd will be grazing within electric fencing for several weeks around Port Soif and will be checked daily by the team which cares for them. 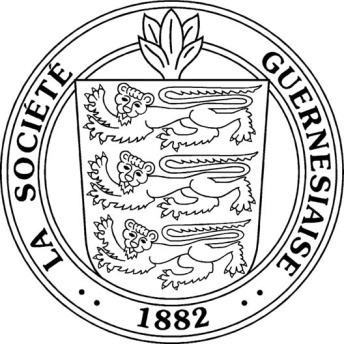 La Société and the Environment Department would welcome assistance from regular dog walkers and people who walk or exercise around Port Soif. ‘Watchers’ are sought to keep an eye on the cattle when they’re passing and report any problems or concerns to the Conservation Herd team. Anyone who would like more information on the Conservation Herd is welcome to contact conservationherd@societe.org.gg and follow the project on Facebook. Visit the online map here to track where they are grazing. The European Red List of Birds, published this month by the European Commission, reveals that habitat loss and climate change have caused the declines of 20 per cent of European bird species. After three years of work, led by BirdLife International and financed by the European Commission, this report will set the base for European conservation and policy work over the coming years. The Red List is widely recognised as the most authoritative and objective system for assessing the extinction risk of species. Iván Ramírez, Head of Conservation at BirdLife International (European and Central Asian Division) said: “The new European Red List of Birds is a call to arms for the conservation of our natural world. It is inspiring to see that many species targeted by conservation efforts and supported by key tools such as the Birds Directive and the LIFE programme are recovering. Yet it is shocking to see many species that used to be common now listed as threatened. It is deeply worrying to contemplate the possibility of a world with no puffins, European turtle doves, northern lapwings or oystercatchers“. 13 per cent (67 species) of the 533 species assessed are threatened at European level, of which 10 are Critically Endangered (the highest threat level). Among them some iconic birds such as: sociable lapwing, yellow-breasted bunting, slender-billed curlew (which is probably already extinct) and, of local importance, Balearic Shearwater. The study also found that 18 species are Endangered and an additional 39 Vulnerable. A total of 29 species have been uplisted since 2004, having been formerly considered to be of Least Concern but now threatened or Near Threatened in Europe. 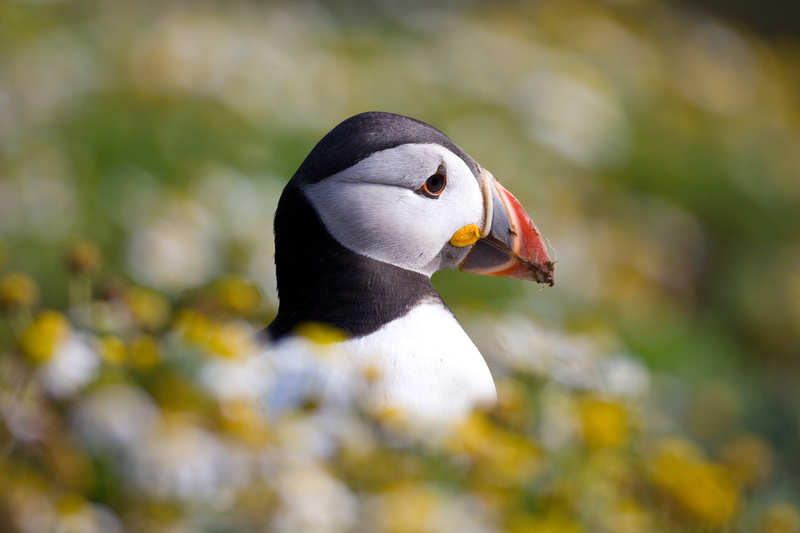 These species include, of local importance, European turtle dove, oystercatcher, puffin, razorbill, meadow pipit, kittiwake and common pochard. 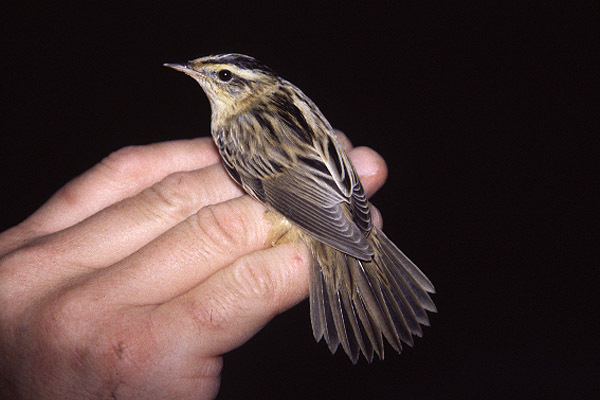 Some further species that were identified as being in trouble a decade ago have still not improved including Egyptian vulture, greater spotted eagle and little bustard but also aquatic warbler and northern lapwing. Improvements include a total of 20 species which were previously considered regionally threatened, and are now classified as Least Concern in Europe (although some are still globally threatened). These include Dalmatian pelican, ferruginous duck, stone-curlew, black kite, lesser kestrel, long-legged buzzard, gull-billed tern, black-throated diver and great bustard. Another 25 species are still threatened in Europe, but now have a lower extinction risk than a decade ago, and have seen their threat level downlisted. For example, Zino’s petrel and Azores bullfinch, both previously considered to be Critically Endangered, are now classified as Endangered.